Ripley is an exceptionally happy, affectionate, & intelligent 6 month old Chocolate Lab Puppy. Her owners contacted me for Dog Training in Katonah NY, and in just three weeks of training, she has made fantastic progress with her obedience commands! “My family loves dogs – we have had anywhere from 1-3 dogs in our house. I volunteer in animal rescue and am a board member for the PAWs organization. As much as we love our pets and think we are good owners, I would never say our pets were particularly well trained. We thought we were doing a lot of things well, but we kept getting the same results…very lovable loyal pets that would occasionally have accidents and do not regularly follow commands. 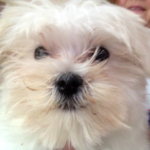 We recently got another puppy named Bogie – this time we knew we needed a new approach. Instead of assuming we knew how to raise a puppy, we really researched puppy training. During our extensive research, the most helpful articles were posted by S.R Dog Training. We started crate training (for the first time ever) and we relied on S.R. Dog Training’s blog posts for helpful tips. We were very impressed with the quality of information Steve provided and liked his approach as a trainer. We decided to hire Steve and could not be happier with the results. Some of the challenges we worked on together included housebreaking, mouthing issues, obedience commands, separation anxiety and his interactions with our other dogs. We have made amazing progress on all fronts in a very short time. Before hiring Steve, we couldn’t even brush Bogie without having him try to chew on our hands/brush or try to jump on us. Now he sits like an angel when we groom him. 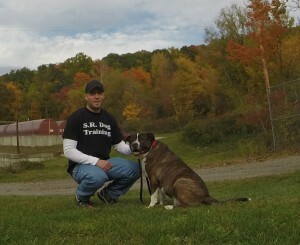 Bogie’s success story of Dog Training in Katonah NY is very typical of what you can expect from S.R. Dog Training. I only use a simple, safe, and effective puppy training, obedience training, and dog training principles that works with any dog and any problem. Mila’s owner was looking for Dog Training in Katonah NY and contacted me for help. 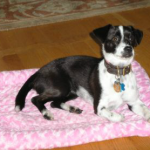 Mila is a 5 month old Feist/Terrier mix who was not housebroken and lacked any obedience training. 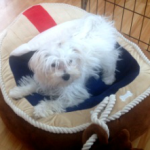 We implemented a complete housebreaking protocol, which solved Mila’s housebreaking issues in one week. We also started beginner level obedience training which Mila learned very quickly. Within just eight weeks, we were able to have Mila off leash obedience trained using low level remote collar training. Her owner works as an equestrian trainer at a horse farm, so Mila runs free without a leash all day. For safety reasons, it was essential that Mila be reliable with her obedience commands despite the presence of a high level of distractions. We utilize treats in the beginner level of obedience training, but gradually fade them away. True obedience training is the dog listening to your commands without having to bribe them with a treat and having your dog listen to your command the first time you say it. Whether you are in need of dog training in Katonah NY of anywhere else, these same guidelines of successful obedience training should still apply. Using a safe, simple, and effective training principles enables all dogs; regardless of breed, size or age to be fully trained. There is no need for you to struggle with your older dog or new puppy. Simply begin using proven dog training principles, and you can achieve the stress free relationship you have always wanted with your dog. Teddy and Echo are two 100+lb adult Newfoundlands. Their owner contacted me for Dog Training in Katonah NY, as she wanted to comfortably walk both of these strong dogs at the same time. As with many of my clients, she worked with another well-known dog trainer who was unable to help her. Within just 30 minutes, we were able to achieve these amazing results and solve a problem that has been plaguing her for several years. This just goes to show what can be achieved with using sound dog training principles that are proven effective with dogs of any breed, age or size.